Our 13th annual Kerran Mudgway Memorial Club Championships got underway at Lake Alexander on Sunday in perfect conditions. Huge thanks to volunteer RD Dave Glass who, along with club VP John Arrigo and other key helpers ensured the event ran as smooth as can be. Thanks to you all and a big shout out to the water safety guys for also hauling in the buoys and to the St John’s crew whose presence is always reassuring (love that their services weren’t called upon). Big shout out to the Blue Cycles crew who were also on hand to help out with any mechanicals and as well assisted the RD with other tasks. They make great aid station volunteers! And a big thank you to the competitors who helped with packing away racks etc following the Club Championship event. Your assistance was greatly appreciated. Note: Close of entry - midday next Wednesday. 1. We are currently putting together our 2014-2015 events calendar. 2. This is an URGENT call for a volunteer to act as Race Director for our open water event scheduled on 13 July 2014. If you can help please email. 1. Past committee member Robbie Andrews has qualified for Kona again via Ironman Australia. 2. 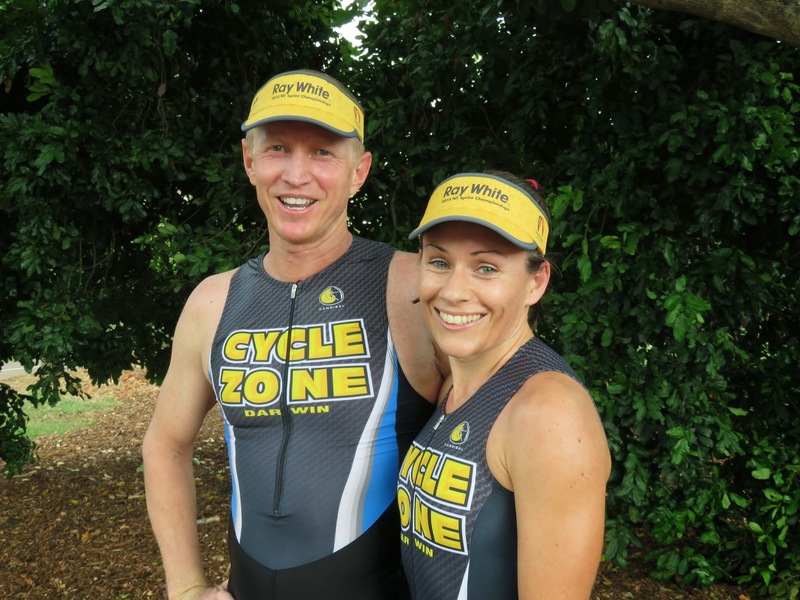 Many will be pleased to know former members Naomi and Leigh Milne are now an iron couple after IM OZ on Sunday. 3. Welcome back Kotter award to Scott Hanrahan who completed his first tri on Sunday - after a break of 13 years! 4. Cath Meng’s farewell race at Lake Alex was finished in style and with a big smile. Best wishes for your move Cath, we know fond memories of our club will go with you. 5. Quick recovery wishes to Jason Cook and Hollie Goodall. Both are recovering from recent surgery, Jason on his back and Hollie her knee. 6. Kylie Gaffel had a great day out at IM OZ - just nine months after having her baby. Super Mum! 7. Hear Tom O’Neil’s day didn’t quite to plan at Port Mac with broken spokes hampering his ride. 8. We had a number of members competing in teams at the Lake Argyle Swims at the weekend. Best placed was team “Up for It” which included Ron Griep, Moira Wigley and Jo Ellis. They finished the 20km in 5:12:29. Full results here. 9. Date claimer for next year’s Lake Argyle Swim – 2 May 2015. 10. Good luck Alison Croser, who we hear is heading off to tackle the Macedon Trail Run at the weekend. 11. Entry is now open for Katherine Ultra Challenge. 12. Mark Edmonds dropped in to say hello at the club champs, as did Life Member Al Stancombe. 13. Tony Burns’ fund raising efforts are ramping up ahead of his July run. You can learn more about the run & the John Maclean Foundation here. 14. Congrats to Nikki Roddie (9th) who made top 10 female at Geneva Marathon.